Only five ingredients, this EASY salmon recipe is both quick AND delicious! Plus don’t forget all those omega-3 fatty acids you get from eating this wonderful fish that takes less than ten minutes to cook. I love salmon, I could eat it everyday but if salmon is not your thing, you could make this with another fish such as cod or bass. So many of my friends have cookbooks hitting shelves now, so this week I am supporting my friends and sharing a recipe from each of their books. Today I am thrilled to share this delicious salmon recipe from Jennifer Farley’s new cookbook The Gourmet Kitchen. Jennifer is a wonderful cook and a great photographer. Her cookbook is filled with approachable, gourmet dishes for a home gourmet, all of which she photographed herself. I never order salmon in restaurants because they always over-cook it and it’s so easy to make at home. This dish couldn’t be easier, let the fish marinate 20 minutes then roast for 8 to 10 minutes. While it’s in the oven, take the marinade and reduce it into a glaze that you pour over the fish – DELISH! This recipe makes four servings, but since it was just me and my aunt I made half the recipe and also roasted some Brussels sprouts to make it meal. If you wish to do this, this works best for two servings – cut the Brussels in half, spray with a little olive oil and pinch of salt and roast until just done, then add the fish and proceed as directed. Quick and easy, 5-ingredient salmon dish! Combine maple syrup, soy sauce, sriracha and garlic in a small bowl, pour into a gallon sized resealable bag and add the salmon. Marinate 20 to 60 minutes, turning once in a while. Preheat oven to 425°F. Lightly grease a baking sheet with nonstick spray. Remove the fish from the marinade and pat dry with paper towels. Pour the marinade in a small saucepan. Place the fish on the baking sheet and cook 8 to 10 minutes. Meanwhile, bring the marinade to a simmer over medium heat and reduce until it thickens into a glaze. Spoon over fish just before eating. Slightly adapted from The Gourmet Kitchen cookbook (affilate link). I made this for dinner tonight, sooooo very good!. How much coconut aminos if using in place of soy? Is it low salt? I have some just not sure yet how to use. Thanks! Yes you can replace with coconut aminos, 1:1 ratio. WONDERFUL. I’ve made this at least a half a dozen times for all sorts of people and it’s always a hit (even my roommate, who doesn’t like fish OR Brussels sprouts, which is a must with this). It’s my favorite meal to impress that is actually super simple and easy, so it’s a win-win! Best Salmon I’ve ever tasted. Make it a lot. Love, love, love this recipe. My husband did, too! I will be making this recipe again tonight. It has become our favorite way to prepare salmon. Great! Glad you enjoy it! So easy and delicious! My 18 year old is already requesting I make it agian! I added gochujang, ginger and a bit of sesame oil to mine to give it a Korean flair. Really good! Still adds up to 3 smartpoints! Thanks for the recipe! This was to die for, and so simple. I grilled for about 3 or 4 minutes per side instead of using the oven. Grilling made the salmon skin crispy and divine. Thank you for another amazing recipe! Great flavor ans so quick and easy. Definitely company worthy. 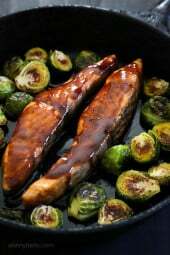 In looking for a recipe for soy and maple sauce for salmon I came across this. Quite easy and good; will definitely use again. Thank you for sharing. DELICIOUS! I made this with swordfish because hubby doesn’t like salmon! 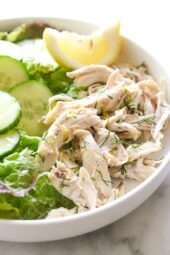 Family favorite, along with so many of Gina’s SkinnyTaste recipes!! This is A-MAZ-ING! So easy and delicious! Absolutely Delicious!!! Simple to prepare but tastes like you took your time. I also roasted Brussel Sprouts with dish perfect easy pairing. Thanks for recipe!! This is SO good. Anyone who is not a big fish fan will love it. My teenage son vacuumed up a half pound of fish in 5 minutes. It’s a regular for us and one of my favorites. This is so good you will want fish everyday. My only change would be to glaze the fish and broil it for a minute or two at the end. This was fantastic! I cooked the salmon in my steam oven using the pre-set masterchef method (meaning cook time and temp are pre-programmed). The salmon came out absolutely perfect. Loved the sweet, savory and spicy flavors. I served with some cous cous and a side salad. Will definitely be making this one again. Used frozen fillets from Publix for ease. OMG was this DELISH! Very easy to follow and time-saving. I did find that the reduction sauce was still too salty even though I used reduced sodium soy. Will make it again and invite company to share. I would like suggestions for other fast and easy accompaniments to wow guests. Seriously the best salmon recipe ever! Made it twice in two weeks! Thanks so much! You can omit it if you wish. I accidentally let the salmon marinate overnight. Should I not use it, or can I still cook as is? I’m having friends over for dinner, so I don’t want to take any chances. Made this for dinner tonight. Delish! 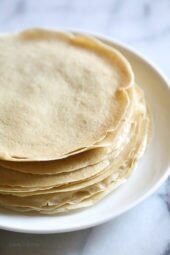 Delicious and sooo easy to prepare! The glaze reduces down nicely and adds that extra goodness to the dish. Yum!! Thanks, once again, Gina for another great recipe! Was amazing…as usual! My 17 year old said it tasted like the salmon at the hibachi restaurant. Do you think this would work with a white fish such as scrod? I’ve made a similar recipe from another source and absolutely loved – the maple and soy is surprisingly amazing with salmon (had some converters in the household after this one). Just a quick questions, do you think baking with the marinade would be good as well – why put it on after/separate? Best Salmon recipe ever. Made it for company, and it was a huge hit! That’s what I love about your recipes Gina, I can prepare them for company, and no one knows they are eating “Weight Watcher” food! You are my go to website, when I want inspiration for what to make for dinner, and stick to my plan!! I am SO happy I came across this recipe. I typically stay away from recipes when I see sriracha, as it’s not my favorite, but this recipe is TO DIE FOR & so easy. I could seriously eat this every day for dinner. THANK YOU! Would this work with Swordfish? I don’t see why not! Let me know if you try it! Would this work if I made it with tilapia? I’m new to cooking fish. Great recipe! The Sriracha was present but not overwhelming. I paired the salmon with broccoli and brown rice. Thanks for the recipe! Can you make this with frozen salmon? Does it change the cooking time? Yes, but you should let the fish thaw overnight. This salmon blew me away. It was better than restaurant quality! Better yet, it was super simple and made with ingredients we have lying around. Yum. Thank you for posting this! Really spectacular, thank you for this! I had very little salmon experience and this was perfect – easy, fast, and delicious! Do you remove the skin or cook skin side down? The way it was cut, I cooked the skin on it’s side. You can remove or cook skin side down if you wish. I am confused…the recipe calls for skinless salmon but this question was regarding cooking skin side down? Thanks for clarifying. This recipe was amazing! I love a recipe that is simple but delicious. My boyfriend and I are making it again this week. Thanks for all of your great meals! Wonderful and so easy. I have been “training” myself to like more heat in food so I did use the sriracha sauce, but just one teaspoon and it was plenty hot for me. I like baking food too, much easier and more full proof. My salmon was rather thin and only took 6 minutes. It is easy to over cook salmon. My son is in college and only has a stove top, no oven. Is there an option on how to cook this? You can cook it on a skillet about 5 min on each side adding the glaze the last minute. This is insanely good, I think we licked the plates. Will this work with a sugar free maple syrup to keep the points lower? I Always make mine with sugarfree maple syrup, it comes out great! One of my go to recipes, thanks Gina! 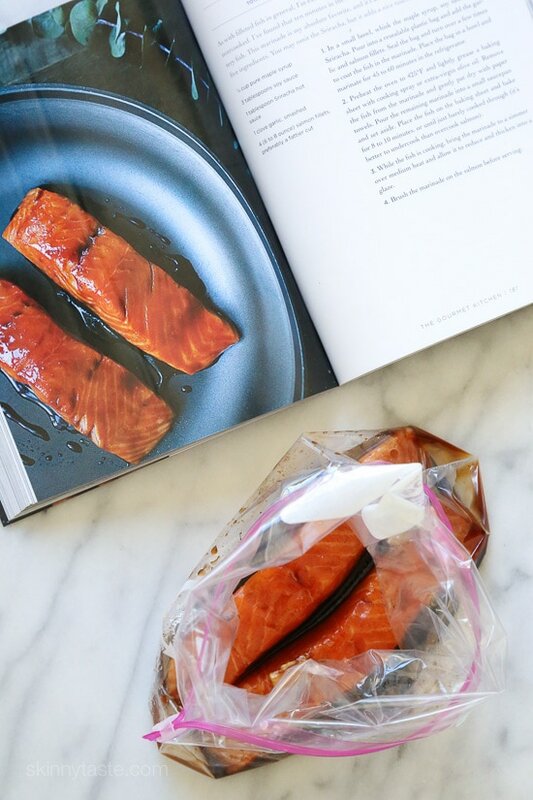 I tried this for the 1st time last night, & it is my new go-to salmon recipe. SOOOOO GOOD!!! That sauce is amazing! And SO EASY!!! Absolutely loved it! Thank you! This was delicious! Your Gochujang glazed salmon will always be my favorite, but I loved the flavors in this recipe. I made the Brussels sprouts just like you did and served the fish over brown rice. Thanks for another winning dish! I rarely write a review but had to for this one! An absolutely delicious salmon recipe! I put a cast iron skillet in the oven while preheating, then when it was hot and time to cook the salmon, I sprayed it with cooking spray and put the salmon in and cooked it in the cast iron. I also thinly sliced some fresh jalapeño and put it alonside the salmon while baking. What ended up was a beautiful brown sear on the salmon and the jalapeños just sort of ‘frizzled’ and were a lovey garnish to the dish. Love all your recipes Gina! Thank you! Really delicious, quick and only 4 ingredients. Used Sambal Oelek in place of sriacha as that’s what I had, and I used non stick aluminum foil to line the cooking sheet for super easy clean up. I usually cook salmon as a whole filet, but opted to cut into steaks like you show, which made for better marinating and shorter cook time. This is going in my quick and easy weeknight recipe file. Winner! Approximately 12-15 minutes before adding the fish. We LOVED the sauce! I’ve had salmon with maple and soy before but the hot sauce made it that much better! I made this over the weekend. It was too salty for me. Next time, I think I’ll cut down on the soy. Try it with coconut aminos instead ! Is this really spicy? It seems like it would be with that amount of sriracha and my husband and I are kind of spice wimps plus we have two little children. no, just a scant amount of heat. You could cut the hot sauce in half the first time, but don’t eliminate it gives this dish a wonderful flavour profile. I just made this for dinner– it was delish! Thank you for the recipe! I made this last night and it was delicious! I make something similar with chicken (Sticky, Sweet, and Spicy Chicken), This is way more WW friendly than that. I also roasted brussel sprouts and made enough for leftovers- so good! Everything sounded good until it states to heat up the marinade and pour over the cooked fish. It has always been instructed to never use marinade that has been in contact with raw food. It would be safer. to separated in the marinade in half and only cook the half not used on the raw fish. As long as it is cooked it will be safe. Made this tonight… so easy and amazingly delicious! My mouth is watering! I can’t wait to try this recipe. Will this amount of sriracha make the salmon very spicy? I like a bit of heat, but not too much. Thanks! I absolutely love salmon too! And normally cook them in parchment parcels for easy clean ups. And same, I never order it in restaurants, the pictures look nice on the menu but the portion is normally measly and comes out burnt or very tough. This looks fantastic, will have to try it! What type of salmon are you using. I never know which is best. Depends on where you live. I’m in the Pacific Northwest, where we have as many types of salmon as there are names for rain. Chinook (King) and Coho are very popular here. Sockeye is beefy red rather than pink, and I think it tends to tasty fishy-er. Steelhead, though not a salmon, would be a decent sub for sockeye. My favorite salmon is Alaskan King from the Copper River Run in Alaska (“Copper River King Salmon”). Buy what’s fresh in your area or flash frozen Wild Alaska King (Chinook) for a sweet, clean fish. I can’t speak to Atlantic Salmon, but have heard Costco carries good flash frozen salmon, which would likely be Atlantic. Former vegetarian learning to love fish, but I’m very selective. 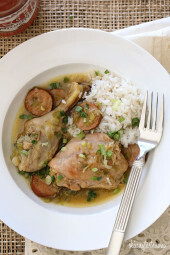 We’re trying this yummy recipe with the brussels sprouts tonight. Will it be safe to use the marinade in which the raw fish was marinating? If you are cooking it then why shouldn’t it be ok? Just my thoughts…. You cook the marinade to make it nice and thick…so no worries about it making you sick. I see that you also cooked them with brusses sprouts. How were those cooked? Looks like a great addition! I always have terrible luck trying to buy salmon. Any tips? Looks really good, what is a substitutePam for the sriracha hot sauce? or can it be left out? You can leave it out or use another hot sauce you prefer. This looks delicious. I’ve never usually been a fan of salmon but maybe I’ll give it another shot with this recipe. Really dumb question. But should you marinate it in the fridge or on the counter? Gina, sorry but this has nothing to do with salmon. Today I made your Pollo in Potaccio from your new cookbook and wanted to say it is beautiful. I could bathe in the sauce, nah, bit messy. Oh so good. Thank you. Do you recommend any brand of siracha? Is there one that is “healthier” than others or are they all about the same? Thanks! I prefer the one with the rooster. This looks delicious! Is her new cookbook Weight Watcher friendly (Smart Points) or can be easily tweaked to make it weight watcher friendly? It IS all Weight Watchers friendly! I love salmon – will have to try and sub coconut aminos for the soy sauce! I used Braggs Liquid Aminos and it was perfect.